National Testing Service (NTS) is an organization in Pakistan which administers assessment tests of academic achievement. 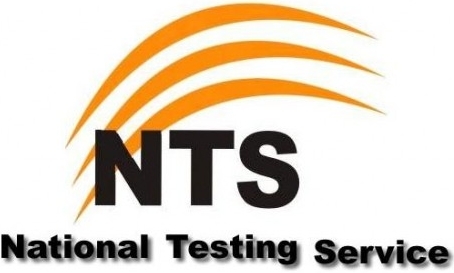 NTS offers two main types of tests, the National Aptitude Test (NAT) and the Graduate Assessment Test (GAT). NAT is aimed at students seeking admission to colleges and universities. GAT is aimed at graduates seeking admission to postgraduate education. NTS exams are also used to determine qualifications of students seeking advanced study abroad. Today in Pakistan NTS test conduct for the Government and Sami government latest jobs with these admissions test. it compulsory for students to cleared these tests conducted by NTS. NTS Tests also used to determine Pakistani students qualifications seeking advanced study abroad. In NTS exam students attempts hundred multiple choice questions in 2 hours and all the questions in MCQs form. In these 100 questions there are 40% question from English section, 30% from analytical and 30% in the mathematics section. For other subjects, there might be a slight variation. NTS Test English section usually comprises antonyms, synonyms, fill-in-the-blanks and reading comprehension questions. In mathematics, which is essentially high school level, the questions consist of basic geometry, sets, basic arithmetic and basic algebra. The analytical section mainly consists of logical puzzles and a few logical reasoning questions. If you are applied for NTS test and want to prepare yourself then here is right place for preparation of all NTS admissions and recruitment test. We are providing students career guide and help to successful on every platform of life. If you are interested to passed NTS Test in maximum numbers then follow our super tips and guide for passed NTS test. You need to prepare your test pattern until the Test day morning. While some students read until last-minute in our knowledge is not the best way to approach an exam. First make timetable for books subjects and days which you have to sit and then start study accordingly. Don’t prepare just one subject a day read mornings on one subject, afternoons on another and evenings on a third. Generally, GAT contain English 40% and 30% quantitative and 30% analytical subjects so make balance and manage of your study on these marks division. you can see detail about these marks division in latest pattern. For prepare any NTS test its must to collect your knowledge. Your first try is improve your general knowledge in English and Urdu both. In our top priority and short time preparation you must read “Who is who” and “what is what” books. Collect your test regard Past Papers, Examples Sheets, Sample papers and must prepare before one week of your exam. Without these helping tools little chance of doing well in an exam. NTS testing agencies provide the paper pattern, format, past papers, content weight-ages and model papers for test preparation, so you must first get help from these resources. These resources are 100% free so try to get benefit from them. One can only use these books as a tool rather than entirely relying on them. As GAT has no fixed syllabus, in the end a book only serves as much as a template for the real test. It’s important to keep a good attitude and remind yourself that you are going to do your best for this test. If you find yourself panicking, take a few deep breaths. For your better preparation don’t talk to other students or any person about right before stress can be contagious. Try to sleep early before the test day. Reach the test centre well in advance and locate your room, seat. keep relax. On this place we are mention again do not read anything on the test day. The GAT has no syllabus so you do not have to complete that sample test from last night. Time management in GAT test is really Important. On test day you may try your own methods of solving the test read all questions carefully and avoid careless errors. Easy part first for build some confidence. Then eliminate obvious incorrect answers. Don’t panic on questions if you have no clue. For consume timing start solving exam with the math section then analytical section and at last part move on to English section. Do not try to spend too much time on a particular question. Other hand divide your time limit on section wise on your NTS exam. If you pick first English section paper then give him time limit only 20 to 30 minutes and next analytical section which include draw a table or diagram, first Read each question carefully. we hope this section will spent your almost paper time but not more than 50 minutes. At last part give math section and solve all those questions that are straight forward and can be done less than 25 minutes. With this strategy last two to three double check your answer sheet to make sure that no question is left unmarked. Dividing the time is very important. In this way you get sufficient time to every question. Reading the questions and thinking of an answer yourself before looking at the given options results in lesser chances of the mistake. Skipping the doubtful questions will prevent you from getting negative marks. If you don’t know answer of any question then try to guess the correct answer from your common sense. If this is not possible then don’t let the test to disturb you mentally. Must avoid cheats cheap ways bluffing and try through intelligently. Post, Job and concerned department related questions are also asked in written test of NTS. So try to collect maximum knowledge about this department which you have applied for. Normally Hundred MCQs types questions are asked and each question carries one mark. Candidates need to get minimum fifty percent marks in NTS to qualify it. But final selection not measured on qualifying and passing marks. Final Selection must included marks performance in Interview so your preparation process not only for test also for final interview. NTS written test papers distributed in five different versions colors which each question paper different questions like its color from each other. Normally question papers of following colors are distributed. So it clear to all of you that cheating is near to impossible these NTS written test due to strict vigilance and different versions of question papers. On last tip if you want to start seriously the preparation of NTS test then you must also appear in CSS, PMS and specially in all PCS exams because when once your general knowledge and English will be improved you will be able to attempt these exams too easily. Try to read English newspapers and follow English news channels for better preparations. We are sharing best and super tips for preparation of NTS and GAT test to passed in maximum numbers with in short time. If you need any related information keep in touch. Must share your views about how to pass NTS test, Write us your precious lines in comments section below. i am preparing and studying for NTS job test . please let me know the good study material to clear the test. 2nd time I failed in nts test how to pas these test? Ma na bhi IB Ma apply kia ha!!! sir i want to apply in NAT test for engineering but my problem is that i have much worried about test unfortunatly my english reading skills is very low standard . what should i do ? dear sir if paper contains subject section contains 90% and 3% english 2% pak study 2% islamiat 2% gk then if i attempt only subjective section and get the 50% result is it qualify or not please help?